How do I cross-list a section? 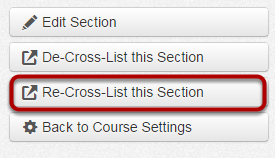 You can only cross-list a section after you have opened the course where the section currently resides. Type the course name in the Search for Course field  or enter the course ID number in the Enter the Course's ID field . The course will appear under the selected course heading . 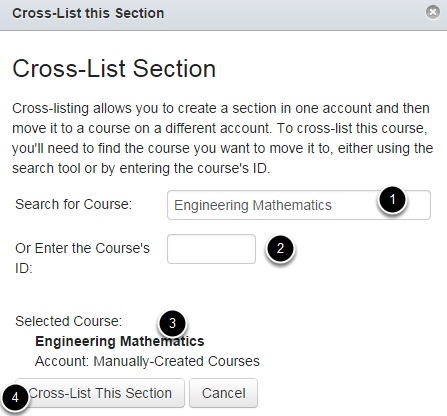 Click the Cross-List This Section button to cross-list the section . A message will appear at the top of your browser confirming your section was cross-listed. You can also verify a section has been cross-listed by looking at the breadcrumbs navigation. Click the Re-Cross-List this Section button. This will re-cross-list the section with a different course. However, when you de-cross-list a section, it will move back to the original course.